Ever wonder what happens after the bloodbath in Hamlet? Well Anthony P. Pennino is about to tell you! I, Horatio follows the PTSD-ridden Horatio as he sets out to tell the world Hamlet's rightful story. And just how will he do it? A play! 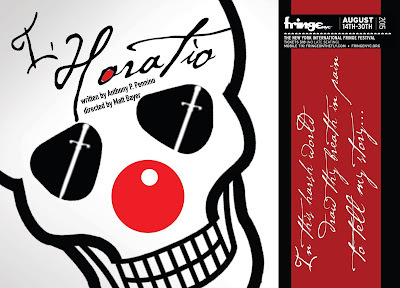 I, Horatio is a twisted comedic take on life post Hamlet. With shades of Quentin Tarantino, Pennino thrusts Horatio into an exiled wasteland where he is left with nothing but the ashes of his departed friend. From a slightly fey Fortinbras to an innkeeper slightly off her rocker, I, Horatio is a modern take on what would happen next in true sequel fashion. The most interesting thesis that the script offers is Penino's take on the relationship that Shakespeare established between Hamlet and Horatio. The one-sided love on the part of Horatio is fascinating. It’s a similar thesis some have for Iago to Othello. And watching Horatio come to his senses, discovering his deep-rooted love for Hamlet, was something smart. Though it needs to be fleshed out further. Penino also layers in some lovely theater jabs that garner the best laughs. Theatrical inside jokes always win. While the constraints of the festival may be to blame, there was just a lot missing in this production. There’s no question that Pennino's script is smart. There is something deep within it. But the execution was just off. As we learn Horatio was in love with Hamlet, we also see Horatio find insta-love with houseboy Tomas. The arc is clever but happens way too fast. Poor naive Tomas was probably just as confused as to what was going on. The other issue that occurred was the complete and utter neglect Osric had for Horatio post scene one. Drunk or not, it’s not very likely Osric would forget who Horatio was. They had been roaming around the castle together for some time prior to this play. The contrived moment felt funny. The way the play is set up, Horatio is the straight man to the whacky characters surrounding him. They're all perfectly over the top but that doesn't mean Horatio can't get to a similar level. Blake Merriman in the title role was just unexciting. Though the still oddly unjustified choice to have Horatio shirtless was used to his advantage. Merriman looked as if he was in a completely different play compared to his fellow actors. Playing traumatic after the first scene made sense. But after? Horatio needed to find something new. Like that carnal rage to seek vengeance. Even going a little psycho could have worked in this piece. When actors did make bold choices, that’s when the fun was had. The highlights in the bunch included Peter Collier's Farquad-esque Fortinbras and Courtney Moors as Nell. Collier’s Fortinbras adopted some strong mannerisms that emphasized the absurdity of the character. Moors had some of the best one-liners that when paired with her impeccable dialect, she brought the house down. Fortinbras has a witty line about pacing late in the play within the play. And isn't it ironic that pacing was a problem? The direction by Matthew Bayer was just, nonexistent. The intent was to slam into scenes but it didn't quite get executed that way. And with no sound to cover the shifts, there was just dead air. And with the entire company not in the same stylistic page, Bayer's vision was blurry. I, Horatio had all the workings of a successful Fringe show but the Fringe seemed to get the best of it. Perhaps in a less stressed environment, I, Horatio can take off.